The congregation departs following Sunday services June 21, 2015, at the Emanuel African Methodist Episcopal Church in Charleston, S.C., days after prosecutors say a white supremacist gunned down nine parishioners during Bible study at the historic black church. 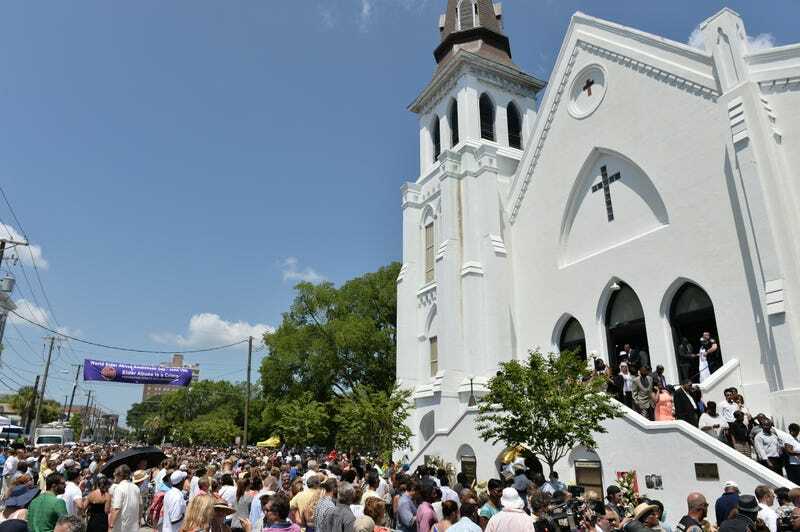 Exactly a year ago, the Emanuel African Methodist Episcopal Church in Charleston, S.C., was left reeling after a horrific mass shooting that claimed the lives of nine victims, including church pastor and state Sen. Clementa Pinckney. Today, Friday, the church is remembering those parishioners, embracing the community with a message of love, as it remember those victims, whose lives were violently ripped from them in the brutal attack, CNN reports. “Let all that you do be done in love,” the church said in a statement on its website, quoting 1 Corinthians 16:14 and encouraging all to perform “Acts of Amazing Grace,” designating June 21, Tuesday, the day of action. The church will be holding several events and services Friday to remember all the victims: Pinckney, Tywanza Sanders, the Rev. Sharonda Singleton, Cynthia Hurd, the Rev. DePayne Middleton-Doctor, Ethel Lance, Susie Jackson, Myra Thompson and the Rev. Daniel Simmons Sr.
“I know the result of people coming and showing their love,” Betty Deas Clark, the current church pastor, said, according to CNN. On Wednesday, more than 150 people gathered for the Wednesday evening Bible study, the same gathering that the shooter targeted last year. This Bible study was led by the Rev. Anthony Thompson, who lost his wife, Myra Thompson, in the tragedy. The anniversary of Charleston’s mass shooting comes less than a week after the mass shooting at a gay nightclub in Orlando, Fla., that left 49 dead and more than 50 injured. Pastor Clark, according to CNN, was in Orlando to show her support for the community, attending counseling sessions with those impacted by the rampage. Clark’s message to those in Orlando?